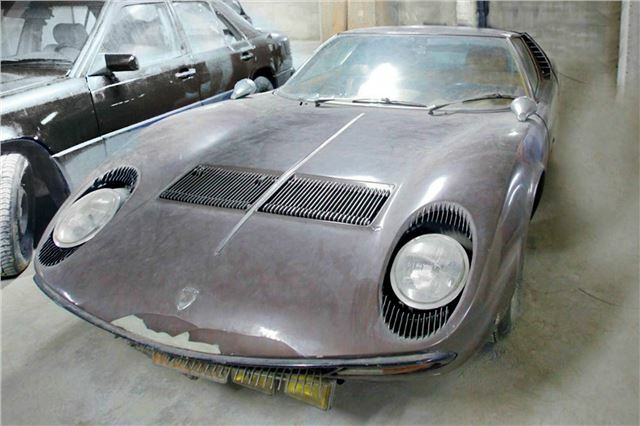 Found in a Greek warehouse after laying undiscovered for decades, this Lambirghini Muira S was once given as a present by Greek shipping tycoon Aristotle Onassis to his favourite Greek pop star of the 60s and 70s, Stamatis Kokotas. The Muira S was one of only 140 ever built and is to be sold at the COYS “True Greats” Christmas auction in London next week on Tuesday December 4th at an estimate of £370,000. Other important collectors’ cars coming up for sale at this auction include a rare 1934 Riley Imp, estimated at £70,000 to £80,000; a 1938 BMW 328 Roadster, estimated at £400,000 to £500,000, and a second fully restored Lamborghini Miura SV, estimated at £370,000 to £420,000. Also on offer is a trio of DB Aston Martins – a DB4, DB5 and DB6, and from the estate of the founder editor of Motorsport magazine, Bill Boddy MBE, his 1935 RAC Rally Talbot Darraq tourer estimated at £14,000 to £18,000. Also featuring in the sale is a beautifully restored Mercedes-Benz 300SL Roadster estimated at £380,000 to £480,000 and a Jaguar SS100. The sale also features the Keeler collection of some 1,000 model cars and associated collectibles. Once again the sale will feature an amazing collection of posters, which includes a number of rare James Bond posters. One of the highlights of the Auction is the French Thunderball double grande, a poster that shows the vast climatic underwater battle from the film, with Sean Connery as James Bond in full combat estimated at £2,400 to £3,000. The English language film posters concentrated more on the multi aspect of the film - the guns, gadgets and girls. James Bond is perhaps the greatest phenomenon of the film industry with 2012 seeing the 50th Anniversary of 007 in the cinema, Dr. No made its debut in 1962 and COYS have an original US One Sheet on offer estimated at £1,000.00 to £1,200.00. In 2013, From Russia with Love celebrates its fiftieth anniversary and what is considered the greatest 007 film poster is on offer at COYS - the UK Quad with the classic gun across chest pose from Sean Connery holding a Walther Air Pistol estimated at £3,500 to £4,000. The production office forgot to bring the PPK to the photo-shoot so the photographer supplied his Walther Air Pistol - the gun has since become a huge 007 symbol yet it was really only capable of serving you with a nasty bruise! For full details of this car and other important entries, please see www.coys.co.uk.